Freddie Gray settlement: Baltimore will pay Gray's family $6.4 million as criminal trial proceeds. 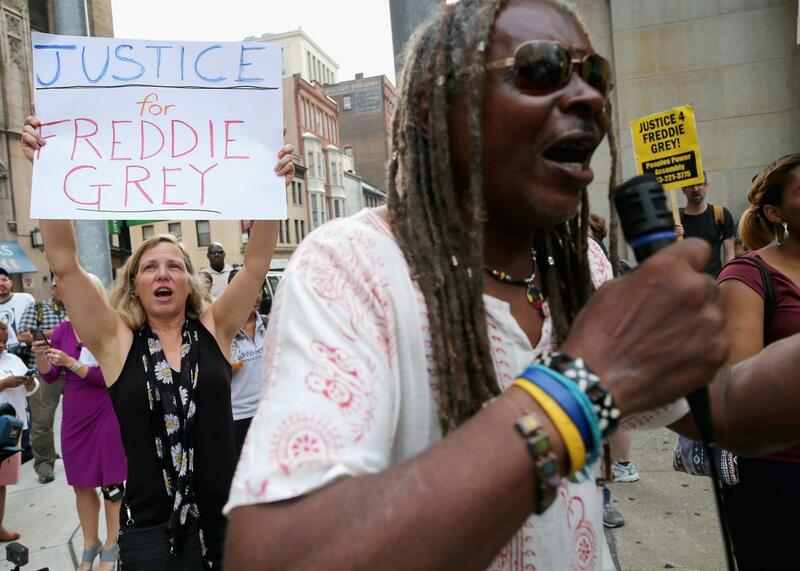 Demonstrators gather on Sept. 2 to protest in front of the Baltimore City Circuit Courthouse East, where pretrial hearings are being held for six police officers charged in the death of Freddie Gray. The city of Baltimore has agreed to pay a $6.4 million settlement to the family of Freddie Gray, who died at age 25 in police custody last April after suffering a serious spinal injury in the back of a police van. His death inspired chaotic demonstrations in Baltimore and became a major flashpoint in the nation’s ongoing reckoning with police brutality against black people. The Baltimore Sun calls the $6.4 million sum extraordinary, noting that “the payment is larger than the total of more than 120 other lawsuits brought against the police department for alleged brutality and misconduct since 2011.” Only six civil suits against the police have ended with settlements exceeding $200,000 since that time. The six officers who were involved in arresting Gray have been charged with crimes by the office of Baltimore’s State’s Attorney Marilyn Mosby. Defense attorneys are expected to argue for a change of venue at a hearing on Wednesday. Justin Fenton of the Baltimore Sun notes on Twitter that today’s settlement will likely become a key part of Wednesday’s discussion about whether the officers can get a fair trial under so much local scrutiny. As explained in the Sun story by David A. Harris, an expert on police misconduct at the University of Pittsburgh School of Law, jurors could potentially be biased if they incorrectly interpret the settlement as an admission of guilt on the part of the city. The settlement is “expected to be approved” at a meeting today, the Sun reports, and according to the office of the mayor, it will be paid out over two years.